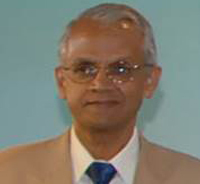 Prof. V. Ramanathan is among the most distinguished climatologists in the world. He identified the famous chlorofluorocarbons, stratospheric ozone and other pollutants as significant factors in the anthropogenic greenhouse effect (man made factors leading to global warming). He also demonstrated the positive amplifying effect of water vapor absorption on global warming, the global cooling effects of clouds on climate. More recently, he made significant contributions to the discovery of the widespread Atmospheric Brown Clouds (ABC) phenomenon. He showed that soot in the clouds led to a reduction in the solar radiation at the ocean surface, heating of the atmosphere and regional climate changed in South Asia. He is a member of the US National Academy of Sciences, the American Philosophical Society, The Academy of Sciences for Developing Countries (TWAS), and the Pontifical Academy of Sciences. For his outstanding contribution to the environment he received the Rosby Award and the Volvo Prize.